1 What is Creative Commons? New technologies have made it easier than ever to create intellectual property such as photos, written works, videos, and software. Copyright law makes it difficult for people to let others know that they are willing to let others use their materials. Creative Commons Licenses allow people to retain the copyright to their works while easily communicating to the public that those materials can be used under certain conditions – basically making their work “some rights reserved” in particular circumstances. It’s not an alternative to copyright – Creative Commons is based on copyright law and in order to grant a CC license to a work you must own the copyright. One of the best benefits to making your work available under a Creative Commons license is that for the uses you approve, you don’t have to interact with the permission-seeker to grant approval – they can just follow the terms of the license and reuse your work – with proper attribution! For users, the primary benefit is finding free material they can use with a relative amount of certainty – if you use CC-licensed material and follow the rules (and do a reality check on the source to ensure that the license is legitimate). Permissions, hefty licensing fees, and even fair use analysis aren’t necessary when you use Creative Commons (or other openly licensed) materials. However, Creative Commons licenses never preclude the fair use of the item. Creative Commons licenses are a combination of four easy to understand principles, illustrated below. All CC licenses require attribution by users – use of CC licensed material (if it’s not a fair use), exceeds the scope of the Creative Commons license, and is an infringement. Attribution: All CC licenses require that others who use your work in any way must give you credit the way you request, but not in a way that suggests you endorse them or their use. If they want to use your work without giving you credit or for endorsement purposes, they must get your permission first. ShareAlike: You let others copy, distribute, display, perform, and modify your work, as long as they distribute any modi ed work on the same terms. If they want to distribute modi ed works under other terms, they must get your permission first. NoDerivs: You let others copy, distribute, display, and perform only original copies of your work. If they want to modify your work, they must get your permission first. NonCommercial: You let others copy, distribute, display, perform, and (unless you have chosen NoDerivs) modify and use your work for any purpose other than commercially unless they get your permission first. 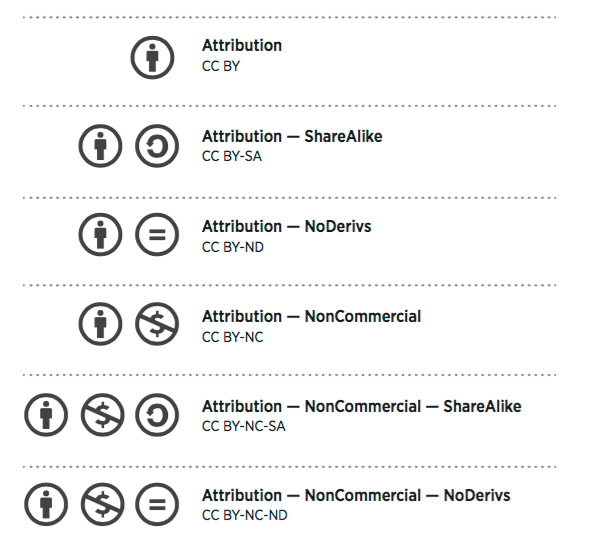 Image from “Six licenses for sharing your work” by Creative Commons, used under CC0 1.0 Universal. Penn State’s Media Commons group has put together a Free Media Resource Page (TIP – scroll to “Browse Free Media Sources”) that has links to a several places to get a variety of media files that can be used for both educational and commercial projects. Citation is important, but especially so for CC-licensed materials. You are legally bound by the license, which is a legal contract, to provide certain minimum attribution for a Creative Commons work. Notice of any modifications you have made. Besides including this information, there’s no specific form or format, or even location. It’s always preferred to use it directly adjacent to the work, but also acceptable to use it in a reasonable spot – it’s flexible! Copyright owners who would like to share their expressive works may do so using a Creative Commons license. This license allows you to specify how you would like other to use your materials without the need to ask your permission. For example, photographs licensed with a “Attribution, Share-Alike” license, can be used and modified by other people as long as they state where the photos came from and agree to share any derivative works. To make your own license, use the Creative Commons License Generator. The CC0 Tool is not a license. It’s a tool to allow copyright owners to waive (give up) all the rights in their work and dedicate it to the public domain without waiting for the rights to expire. The public domain mark isn’t for making something public domain – it’s for marking it as something you know is reasonably free of copyright restrictions worldwide. It can help provide metadata to make free to use works more discoverable online!